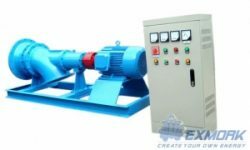 This kind of Micro-hydro Generator is consisted of an inclined impulse turbine and a set of direct connected AC single-phase / three-phase generator. With the characteristics of small body, lightweight, simple structure, reliable operation and convenient assembly, and serving as the power source of lighting, TVs and recorders, it is most suitable for the households in mountain areas with scattered and small hydroelectric sources. The consumers can do easily themselves the installation and operation. This product has been thoroughly strengthened in the special technical measures to good quality, stable function and easy operation for women and children. Much less investment may add more happiness to your family. 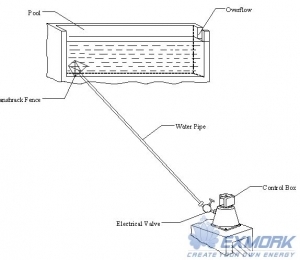 The typical micro hydro generator station is as follows (figure 1),which consists of earthwork(inlet conduit construction,unit room and drain etc),the micro hydro generator,electrical wires and the users wires. The work process is as follows?Collecting the water of stream by reservior,the water inflow the pressure poor through the inlet conduit,the go into th micro hydro generator which is installed in the unit room through the inlet pipeline,force the runner to circumgyate,which drives the genertator to generate electricity.At eh same time,the adjustment machine autoadjust the voltage and the frequency to meet the requirements for power supply,and then the user can use the electricity transmitted hyelectrical wires. 1) Firstly, check whether all components are completed and the intake of penstock is blocked. 2) Then check whether the runner of turbine can be easily rotated, and rotated in by hand to ensure the voltage meter has readings (put the output switch in OFF position). 3) For the first starting, the output switch should be put in the voltage-stabilized control position (A), then open the gate to let water out from small to large, observe the readings meter till 230V (380V) or so continue enhancing water volume, the voltage device is reliable if the reading keep still. 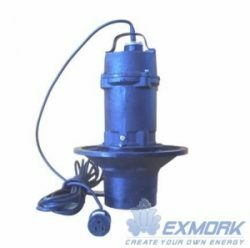 At this time the load can be connected, then adjust the water volume to hold the output of 230V (380V) or so. 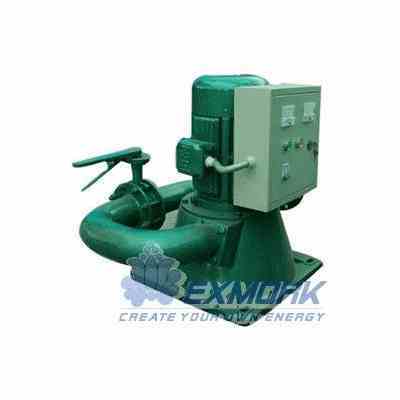 Once the stabilizing device break down, put the switch in B, then the voltage of unit will be under manual-controlled, you may follow the next procedure to control by valve. 4) During the operation, the load should be kept stable as possible as can be. Don’t shut off the load suddenly, or else the high voltage will burn out the rest load, if you must is connect the load, you may decrease water to small volume at first, then disconnect the most part of load when the voltage has dropped to below 380v (you must do as this even you run the unit under the using of voltage-stabilizing device). 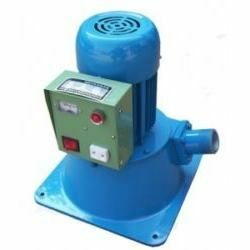 5) It need only close the valve to switch off the unit when the load has been stable after first operation, the power switch may hold on so that you may adjust voltage up to 230V (380V); directly for next running. 1) To check and clean the mud and foreign material blocking in the intake house and trash rack. 2) The frame of unit should be injected water-proof grease by using grease cup in every three month, each time rotating for three times. The upper bearing also should be added waterproof grease for every six months. 3) The generator must be conducted the dry treatment before next start if it became wet.